See those Diamond Previews covers? Well within that issue is your opportunity to order Hero House! Here's what you do. 1) Find a comics retailer near you. You can use Diamond's Comic Shop Locator to find one. 2) Go there and tell them you'd like to order a copy of Hero House. It appears on page 192 in the catalogue and its order number (this is the important part) is SEP09 0592. You might also want to mention how you hear it's going to be really good and the writer writes the very popular Twisted ToyFare Theatre and etc etc etc. You don't have to feel bad about saying these things, because they're all true. 3) Head back to the shop in November and pick up your copy! It's that simple! If you know any comic fans in your life, definitely let them know about it as well. And if you're a retailer or a reviewer and you'd like a PDF copy of the book, just contact me at herohousecomic[at]gmail[dot]com and it's all yours! Okay, I think I might finally be recovered enough from San Diego Comic-Con to write about it. Arcana only brought 40-50 special first-off-the-presses books to the show, but by early afternoon on Sunday they were totally sold out. That means I get to call the book "SMASH HIT SELL-OUT GRAPHIC NOVEL HERO HOUSE!!!!" With four exclamation points like that. ITEM! We've finally got an official Hero House page on the Arcana Comics site! ITEM! Apparently the book will be available in September on Amazon, but if you REALLY love me you'll wait to buy it in November at your local comic shop, to better help spread the word about it. Either way, I'll have all the details on how to get it here at AclinCorp. ITEM! Speaking of spreading the word, I'm a guest this week on the exemplary interview podcast The People You Don't Know. The interview touches on my life and career, Dino Riders and, of course, Hero House. Please check it out, and special thanks to Robert Bricken for tagging me to get interviewed! ITEM! 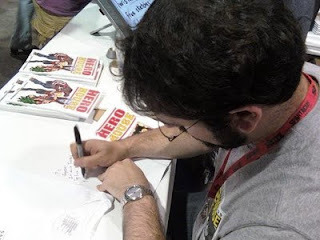 Even though the book has been released (albeit in a very limited manner), the behind-the-scenes antics will not be stopping here at this blog. Keep checking back for more stuff, like a look at the evolution of the Eps team jacket. It's more exiting than it sounds. Thanks for reading! The old SuperFriends show got me into super heroes which got me into comics. I had all the first line of the Super Friends toys as well. 2) How did you start getting into writing? How did you start getting into lettering? Writing started in my Junior year of High School with a focus on movies. A few years after High School a close friend (who was an artist) pitched an idea that i wanted to write for him to draw. When that comic was ready to be published we needed a letterer and I taught myself how to do it. That was almost 10 years ago! I'm a whore for money! Just kidding. 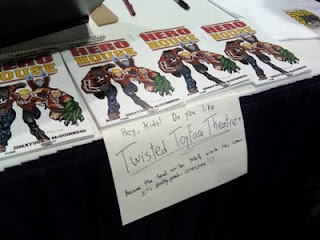 I really have always loved Twisted Toyfare Theater so I read the script when I found out you were a writer for Toyfare (specifically TTT) and loved what I read. 4) What was your favorite part of working on Hero House? The last issue was a ton of fun to letter because it had a lot of different font and balloon styles throughout it. 5) Were there any special challenges of working on it? I have an original graphic novel that is being drawn as we speak and will be available early next 2010 called DETECTIVES IN SPACE. I'm also always lettering books for Arcana. This was a very fun experience and it culminated with me getting a tour of the TTT toy cabinet and getting to hold the Electro doll! There is really no cool job in the world than making comics! 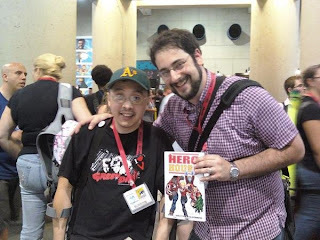 I can't wait to work on the next installment of HERO HOUSE or whatever else Justin and Mike work on next. Also special thanks to my family, computer and dual monitors - without those things none of this would be possible for me.